The French National Institute for Agricultural Research INRA mobilises a broad spectrum of cognitive research, from biology and fundamental ecology to applications in agriculture, nutrition and the environment. INRA has established its orientations (incuding Open Science vision) for the next ten years. "France actively participates in the development of European and global Open Science data policies", - France - Open science country note. agINFRA+, led by Greece; INRA (i.e., MISTEA Joint Research Unit) will be in charge of a subproject focused on big data and plant phenotyping (duration of 3 years)"
Stabilise global warming, reduce food insecurity, ensure energy transitions, construct agricultural systems for the future, prepare Open Science and Big Data… agricultural research will be confronted throughout the 21st century with unprecedented challenges. 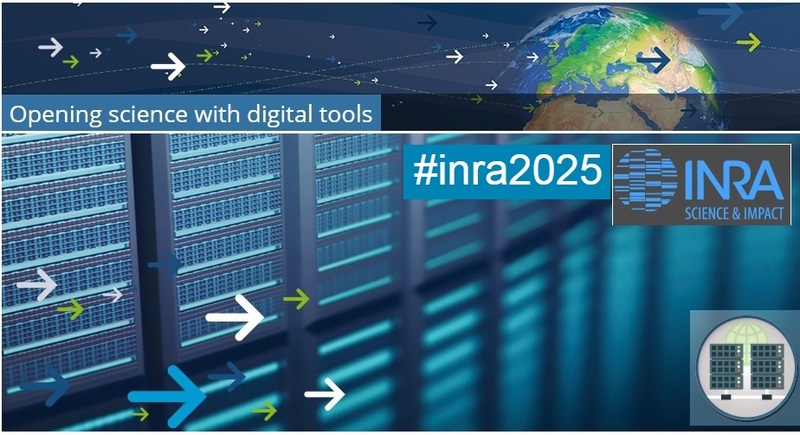 In this context, INRA has decided to update its strategic orientations through to 2025 which has been driven by the priorities of the national research strategy, Sustainable Development Goals (SDGs), recent external evaluations of the Institute, and the last self-assessment report issued by INRA and the collective thinking of its management bodies. Changes to the organisation of INRA and its practices in order to achieve its objectives. The complementarity and competing uses of bioresources to meet food needs in the first instance, and also those for energy, chemistry and biosourced materials. As a generator of knowledge and open data, INRA is committed to sharing its resources with other stakeholders, both inside and outside the research world. The institute is investing in tools and skills that will allow it to better manage its unique digital assets. This reality will redefine the relationships between data producers and data analysts, lead to the invention of novel methods for tackling massive datasets, and contribute to the success of the information economy. The Delegation for Scientific and Technical Information (DIST) represents INRA within the Research Data Alliance (RDA), a global initiative promoting research data sharing. The DIST is an active participant in different RDA working groups. In particular, it has joined with the International Maize and Wheat Improvement Center (CIMMYT) to head a Group on the Interoperability of Wheat Data; the INRA center of Versailles-Grignon is highly involved. The group’s findings are exploited by partners of the Wheat Initiative, an international consortium for wheat research that INRA helped establish in 2011.